This Amalfi coast tour is dedicated to all those who wish to admire the most beautiful places of the Campania region. You will visit Pompeii excavations an archaeological site of great historical value, that will make you understand how the old Romans lived about 2000 years ago. You will relax in some of Ravello villas admiring English gardens and breath taking views. You will spend a marvellous day, full of positive sensations and memorable emotions. The Pompeii Ravello Amalfi Tour starts at 8,30 a.m. leaving from Positano.Our English speaking driver will be waiting for you on perfect time from your hotel to take to the first stop of the excursion: Pompeii, where you can choose to be accompanied by an expert guide to show you the whole Pompeii site. 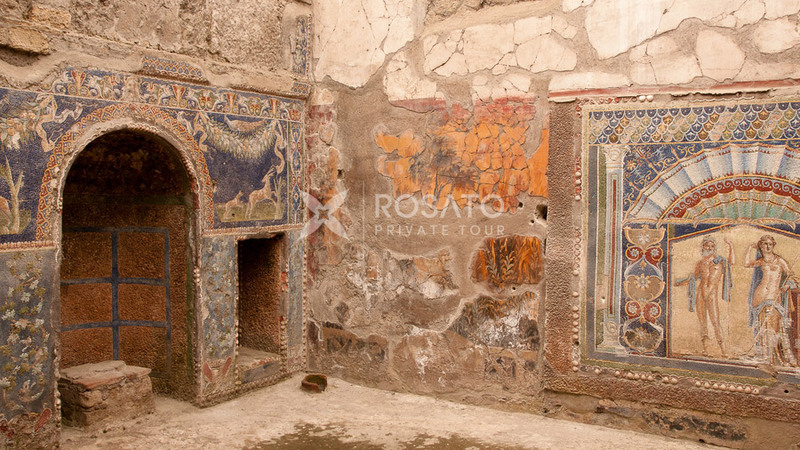 The excavations of Pompeii are a very suggestive and moving in certain places. In 79 A.C., the city was hit by mount Vesuvius eruption. For the inhabitants of that era there was no escape, the lava covered their bodies and the entire city. For thousands of years ancient Pompeii was forgotten and only in 1748 some excavations brought to light the first historical artefacts. Today thanks to the skilled work of archaeologists and historians, we can admire the remains of the Roman city in all its splendour. Buildings, ceramics, mosaics and objects of the time in excellent condition represent the most important testimony of the Roman people. After a couple of hours your tour continues towards the Amalfi coast to go to Ravello. 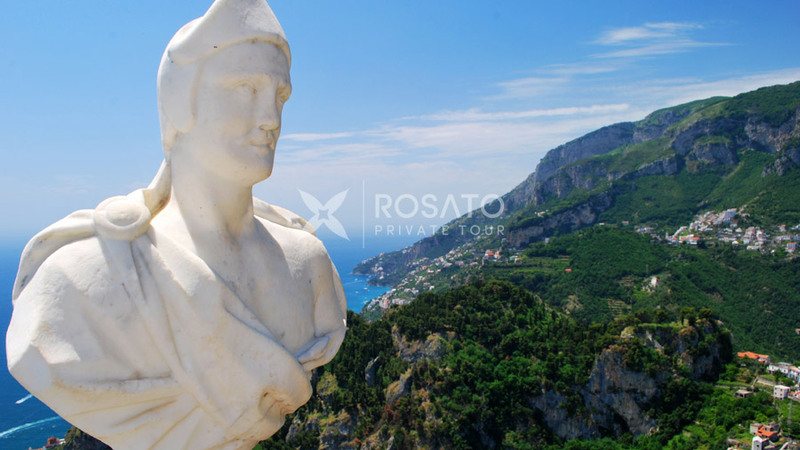 Boccaccio, Virginia Wolf, Winston Churchill are just some of the many famous people who have loved Ravello, one of the most beautiful places of the Amalfi Coast. Our tour includes a visit of the city which lasts about 90 minutes. You can visit VIlla Rufolo, an enchanting architectural complex overlooking the sea from where you can admire the high coast. Every year the Ravello Festival is organized which houses the most important musicians of the international music scene. We also recommend a visit to Villa Cimbrone, from its terrace (called Terrace of Infinity) you can admire the spectacular Amalfi coast from a different perspective. After the visit of Villa Cimbrone, if you desire you can dine in a good local restaurant. 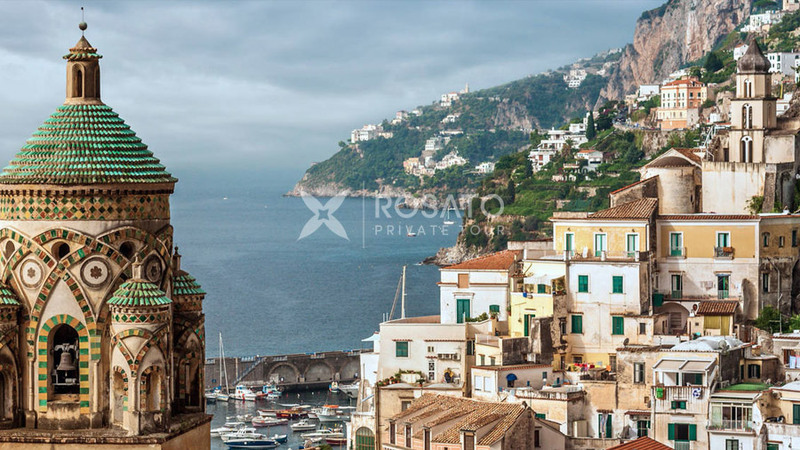 The last stop of our private tour is Amalfi, the first Marine Republic. According to the findings it seems that the city has Roman origins. Today the city is a favourite destination of tourists and travellers. Here you should visit the cathedral which stands imposingly in the middle of the Amalfi square. After the visit you can buy a souvenir or enjoy an ice cream in one of the square’s bars. Our tour ends with a drop off at your hotel.